This is the rarest egret species in North America with a population of approximately 2000 pairs. 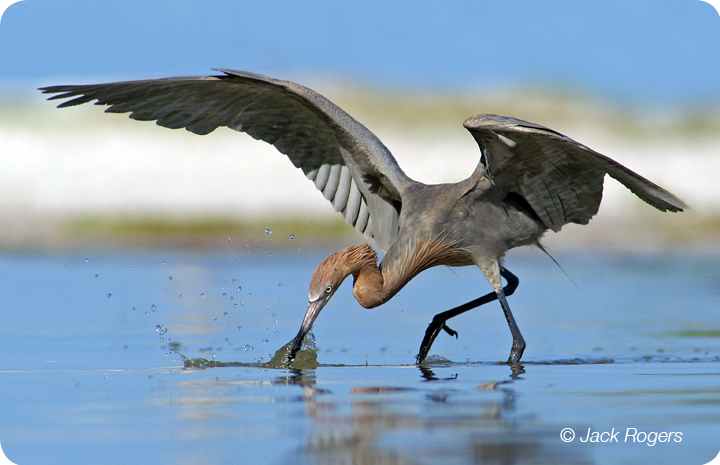 Plume trading in the 1800s nearly decimated the Reddish Egret and their population has remained low ever since, due to a variety of factors from coastal development to nest predation. It is also notable for its two color morphs; dark or white. Mated pairs can be the same or different morphs, and the young they produce can be a mix of both. Today, the dark morph is more numerous than the white morph. According to historical records this was not the case prior to persecution by plume hunters. They can be found frequenting shallow bays and lagoons chasing fish around in spectacular fashion. They will also hunt fish by spreading their wings and standing perfectly still; as a result small schools of fish seek shelter in the shade cast by the egrets wings oblivious to the danger they are in!